﻿﻿Mr. Wu moved to Shaxi from the nearby city of Jianchuan in the early 1990s to teach English in a small elementary school. There he met his future wife, Jiping who was also a teacher at the school. Mr. Wu converted an ancient village theater into one of the more interesting guesthouses in China. Rooms come with all the creature comforts, including hot showers and western toilets. 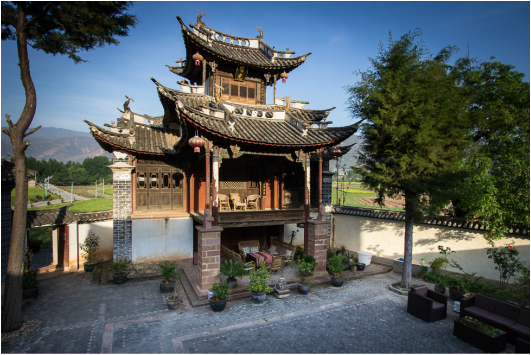 And wake early in the morning to sip your tea overlooking Shaxi's expansive valley. In 2013, Mr. Wu was called back to teach full time at the Duan Village Primary School, just down the road from the Old Theatre Inn, so he gave over management to his partner Chris, an American designer of the Yangshuo Mountain Retreat and long time China entrepreneur. Along with village ladies A Fang and Shi Xiang, and A Mei, Jiping is still at the Old Theatre and still cooks up some of the finest Bai-style cuisine that Yunnan has to offer. Chris since hired Sam, a charming local girl who married into the Duan Village and is improving her English every day. ﻿﻿Sam has many good suggestions about tours, food and other things to do in Shaxi. When guests stay at Shaxi Old Theatre Inn, they experience being in a locally run family guesthouse. With all of the staff living in the same village where the inn is located, they treat guests as being in their own home. While the staff don't yet have the advanced English as Chinese from other provinces who work in Shaxi hotels, the ladies from Duan Village have a unique warmth and natural hospitality. When the inn is not busy, guests may be invited to a staff family home for lunch. Please welcome Sam (Duan Qi Hui 段琪慧) our beautiful and charming local manager. Sam was born in nearby Er Yuan amd married into the Duan Village where she has been the Resident Manager at Old Theatre Inn for nearly two years. Guests rave about Sam and her wonderful sincere service, as well as her rapidly improving English. We hope you will have the chance to meet her! As a heritage hotel, Shaxi Old Theatre Inn was once a village school, and its guestrooms former classrooms that date back over 200 years. We've transformed the five classrooms into cozy queen and twin guestrooms, featuring down pillow, 600 thread-count sheets, antique furnishings, private ensuite bath with separate washrooms, Tibetan wool rugs and plenty of outlets for charging personal electronics.